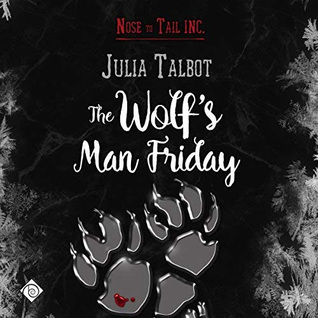 'The Wolf's Man Friday' is the second book in Julia Talbot's series 'Nose to Tail Inc' and while it was marginally better than 'Wolfmanny' it was still just ok. The overall plot worked for me it was a bit of a romantic thriller. Sebastian Zeller is a werewolf whose Uncle has been grooming him to take over as the pack Alpha when he retires and the last thing in the world that Sebastian wants is the title of Alpha. He just wants to work in his studio creating and designing fabrics for the company business...it's not that Sebastian isn't alpha or can't be when he needs to because he shows his alpha side on more than one occasions. When Sebastian's uncle is injured in a mysterious attack, Sebastian is forced to leave his much loved home in Colorado to step in while he recovers but when his uncle discovers that Sebastian has taken it upon himself to discover who attacked his uncle...well, Uncle Ron takes measures of his own and brings in private security for his much loved nephew under the guise of a personal assistant in the form of Jaxon Reedis. One of Nose to Tail Inc.'s best bodyguards. Sebastian feels that he neither wants nor needs Jaxon's protection so not only does Jaxon have to protect Sebastian but he's got to stay one step ahead of the man to ensure the doesn't get rid of him one way or another. The big win for me in this one was Jaxon. He was adorable, confident, smart, cute and cunning not to mention that he's a total fox...no really he's a fox shifter...hence the smart, cute and cunning. Not only does Jaxon manage to get Sebastian to keep him but he does his job of protecting Sebastian without Sebastian even realizing what's going on. While I liked Jaxon a bit more than Sebastian, I did still like Sebastian and I enjoyed the interactions between these two as well as Sebastian's best friend Adam...who, Sebastian would happily endorse for the position of Alpha and who honestly seems more suited to the role...so here's hoping that Adam gets his own story because I liked this character and I'd love to see him get a bit of happy. Another plus for me with this audio was that I got to once again enjoy the narrations of Joseph Morgan, who was also the narrator for 'Wolfmanny' and whose narrations once again added enough depth, emotion and color to keep me listening to the end, making the not so great parts ok and the good parts just a bit better. 'The Wolf's Man Friday' was a pleasant and entertaining enough way to spend a few hours, but it didn't quite engage me the way I had hoped it would. I know I've said this before but I think part of my problem is that for me whenever I read or listen to a story by this author I tend to compare it to her 'Thatchers' series and I hard-core loved that series. It was early days M/M for me when I found the 'Thatchers' one of the few series that I can honestly say I have read multiple times...3 times at least but I'm willing to bet more and now that I'm thinking about it...maybe it's time for a re-read of an old favorite. I'm not sure where this series is going from here but as well as Adam there were a couple of characters introduced in this one that interested me and even though I didn't connect with this one as much as I would have liked I'm still going to keep this series on my radar just in case. An audio book of 'The Wolf's Man Friday' was graciously provided by the publisher in exchange for an honest review.